This cottage boasts separated bedrooms, one in the walk-out basement with a three-piece bathroom and games room heated with a gas fireplace and the vaulted Master Bedroom suite on the totally dedicated upper level with an interior balcony over looking the Great Room below. The two-story vaulted Great Room also boasts a gas fireplace, exposed ceiling beams and a two-story glass rear facing wall opening onto the deck through two sets of French doors. 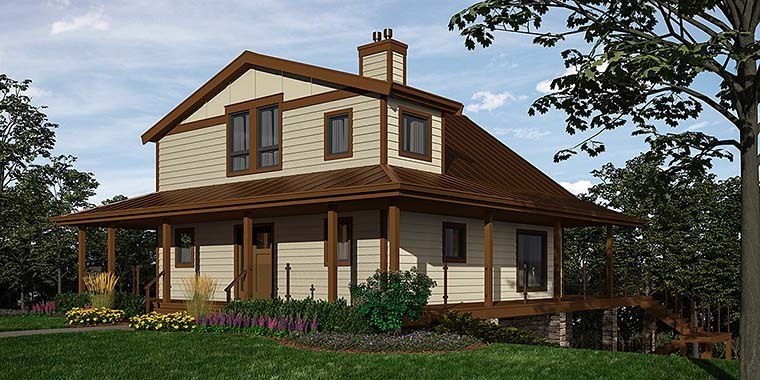 This classic compact cottage exterior is adorned with stone, glass railings and appealing sheet metal roofing.